900 MW were generated by the first Kudankulam reactor and it is likely that the plant will attain maximum capacity next week. The first reactor of the Russian-built Kudankulam Nuclear Power Plant (KNPP) reached 90 percent of its operating capacity on May 5, sources told RIR. 900 MW were generated by the reactor and it is likely that the plant will attain maximum capacity next week, the sources said. Unit 1 was synchronised to the power grid on October 22, 2013, generating 160 MW. The power was further raised to 500 MW, 750 MW and will be raised 1,000 MW in the final stage. At every stage, various tests are conducted and the technical parameters are verified. Based on the results of the tests at each of the stages and with AERB clearances, subsequent stages are reached. With the addition of Unit 1 of 1,000 MWe capacity, nuclear power contribution in the country will increase from 4,780 MWe to 5,780 MWe. Unit 1 is the 20th nuclear power station of the Nuclear Power Corporation of India Limited connected to power grid in the country. In the middle of July 2013, India’s Atomic Energy Regulatory Board (AERB) gave the green light to the launching of the first unit at the Kudankulam nuclear power plant. The board granted Clearance for the First Approach to Criticality (FAC) of Unit 1 as the next major stage of its commissioning. FAC is the commencement of the controlled nuclear fission process for the first time and is a step towards the subsequent beginning of power production in a nuclear reactor, it explained. 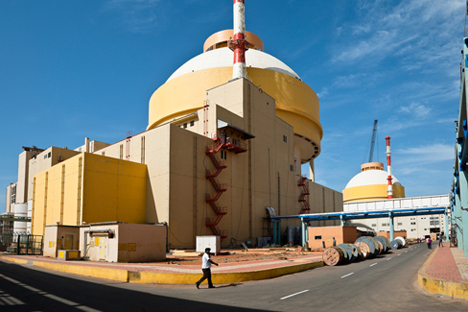 Unit 1 is the first of two units of VVER reactors located at Kudankulam, Tamil Nadu, with installed capacity of 1,000 MW each. It is the first commercial pressurised water reactor-based nuclear power plant in the country. In 2010 Russia and India signed a roadmap for building up to 14-16 Russian-design power units in India. The Kudankulam nuclear power plant being built with Russia’s assistance can withstand a strong earthquake or tsunami, members of the government committee for the evaluation of the nuclear power plant's safety said. However the commissioning of the first stage of the Kudankulam nuclear power plant scheduled for late 2011 was delayed by mass protests that demanded its closure. Prime Minister Singh said that protests at the KNPP construction site reflected people’s safety and environmental concerns, and stressed that the government took them seriously. The government set up an independent group of expects to respond all legitimate and realistic needs and concerns among the local population, he said. Singh stressed that cooperation between Russia and India in the field of nuclear energy, specifically under the KNPP, was progressing. He said that the development of the Indian nuclear programme is a key element of the bilateral partnership. The construction of unit No. 1 at the Kudankulam nuclear power plant has been completed and it will soon start generating electricity. India is planning to build 19 nuclear power units with a combined capacity of 17,400 MW by 2017. Eight of them will be built in cooperation with other countries. Russia will help to build units 3 and 4 at the Kudankulam nuclear power plant. Each will have a capacity of 1,000 MW. Rosatom Head Kiriyenko said the coordination of commercial terms of building units 3 and 4 at the Kudankulam nuclear power plant had been completed. “We earlier signed an agreement on a loan to India to build Units 3 and 4. The technical parameters have also been approved,” he said. The KNPP will supply electricity not only to the state of Tamil Nadu, where it is located, but also the whole south of India.